Also serving communities of Winnebago, Roscoe, Rockton. There are 13 Assisted Living Facilities in the Rockford area, with 12 in Rockford and 1 nearby. The average cost of assisted living in Rockford is $3,159 per month. This is lower than the national median of $3,346. To help you with your search, browse the 82 reviews below for assisted living facilities in Rockford. On average, consumers rate assisted living in Rockford 4.2 out of 5 stars. Better rated regions include Beloit with an average rating of 4.8 out of 5 stars. Caring.com has helped 10 families in Rockford find high-quality senior care. To speak with one of our Family Advisors about assisted living options and costs in Rockford, call (855) 863-8283. Located in northern Illinois on the Rock River, Rockford is known as "The Forest City." Residents of all ages can partake in the parks, arts and museums in the city. In Illinois, assisted living facilities are known as assisted living or shared housing establishments and are regulated by the Division of Assisted Living of the Illinois Department of Public Health. The Rockford area features 16 assisted living communities, with 12 in Rockford itself and another four in nearby towns, like Roscoe and Winnebago. The biggest disadvantage of living in Rockford as far as weather goes is the amount of snow it receives from November to April. New snow falls in Rockford about 28 days per year, and the average yearly total is 36.7 inches. The high temperatures range from 29 degrees Fahrenheit in January to 85 degrees in July. The cost of living in Rockford is 10 percent lower than the national average. Housing and utilities are the lowest expenses, which are 23 and 21 percent below the national average, respectively. Health care costs are 10 percent higher than the national average, and transportation costs are 5 percent higher. Rockford has a high crime rate and is safer than only 4 percent of U.S. cities. The annual rate of violent crime in Rockford is 16.9 per 1,000 people, which is higher than the state rate of 4.36 and the national median of 4.0. The Rockford Mass Transit District provides public transportation in Rockford. Senior citizens can ride for free with an RMTD ID card, which costs $5 and requires proof of age. The Illinois Benefits Access Program also provides free transportation to anyone with a Medicaid card. Rockford has an array of community resources for seniors, including Rockford Public Schools, which provide regular activities for senior citizens, such as monthly luncheons, day trips and an annual craft fair, as well as discount passes to community members 60 and over. Specific activities are listed in a bimonthly newsletter. The Rockford area is home to world-class medical facilities, including SwedishAmerican Hospital, Mercyhealth Hospital-Rockton Avenue and OSF Saint Anthony Medical Center, in the event of medical emergencies or illness. Assisted Living costs in Rockford start around $3,159 per month on average, while the nationwide average cost of assisted living is $4,000 per month, according to the latest figures from Genworth’s Cost of Care Survey. It’s important to note that assisted living rates in Rockford and the surrounding suburbs can vary widely based on factors such as location, the level of care needed, apartment size and the types of amenities offered at each community. Medicaid in Illinois does not cover the costs of assisted living or shared housing. 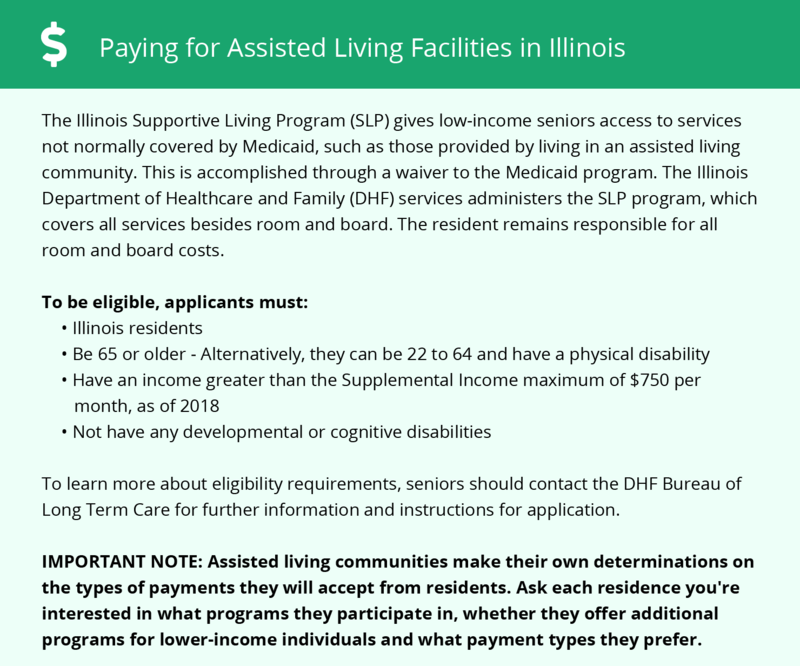 The Illinois Supportive Living Program can help offset the cost of services received in AL. Social Security Income recipients may be eligible for an Optional State Supplement (OSS). Rockford and the surrounding area are home to numerous government agencies and non-profit organizations offering help for seniors searching for or currently residing in an assisted living community. These organizations can also provide assistance in a number of other eldercare services such as geriatric care management, elder law advice, estate planning, finding home care and health and wellness programs. To see a list of free assisted living resources in Rockford, please visit our Assisted Living in Illinois page. Rockford-area assisted living communities must adhere to the comprehensive set of state laws and regulations that all assisted living communities in Illinois are required to follow. Visit our Assisted Living in Illinois page for more information about these laws.